The water industry has always had a strong focus on amenity, wellbeing and health, but it has been a struggle to effectively measure the contributions in this area. The public health industry measures health and wellbeing in life expectancy and disability-free life years. By measuring these figures across Victoria, we can see a seven-year difference in life expectancy between the most- and least-privileged municipalities and a seventeen-year difference in disability-free life years. This translates into an economic burden to Victoria of between $3 billion and $5 billion a year. By unbundling the differences in health and wellbeing between municipal regions, public health experts have found that the largest determinants to health and wellbeing are socio-economic (40%), behavioural (30%), clinical (20%) and the physical environment (10%). 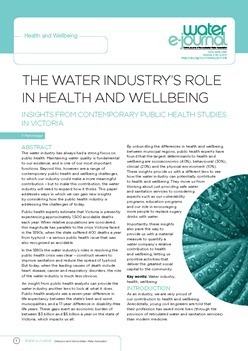 These insights open up a range of diverse ways that the water industry can potentially contribute to health and wellbeing. They move us from thinking about just providing safe water and sanitation services to considering aspects such as our vulnerability programs, education programs and role in encouraging more people to replace sugary drinks with water. We need to improve how we assess our contribution to health and wellbeing, and translate this into day-to-day decisions that maximise the outcomes for our customers and communities. Yarra Valley Water is currently piloting a new approach to measuring its contributions to health and wellbeing by quantifying social impacts in financial terms – an emerging discipline known as integrated profit and loss (IP&L). The methodology produces insights that help us prioritise our efforts to maximise social value beyond the traditional business case, particularly as this value relates to health and wellbeing. To access the full article, login to the AWA website to access this member-only content. Not a member? You can purchase the paper in their Online Document Library.